Tom gets pointers from a Canon photographer. For the last several years, Canon Photography in the Parks has spent a couple of weeks in Yosemite. 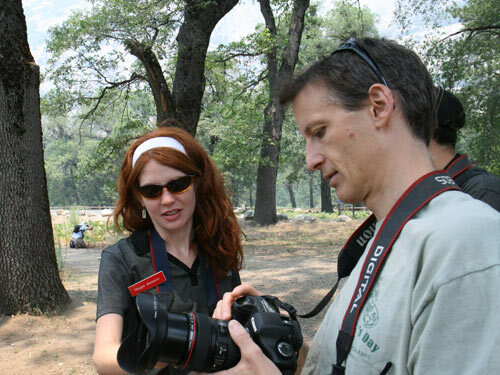 They have a stand set up right on the Yosemite Mall in front of the Visitor’s Center where you can sign up in advance to go on a 2-hour photo walk, get instruction from their staff photographers, and borrow their fancy-dance SLR cameras and lenses – for FREE. That’s exciting enough to repeat – FREE! FREE! FREE! When you are finished with your walk, they keep track of which camera you used and therefore which chip your pictures are on, and then they send you an email later so that you can retrieve all of your images. Tom and I have been thinking about new and improved lenses practically since we bought our new Canon XSi, and this is a great try before you buy option. The first time I visited their site, I saw the Photography Contest header and didn’t wait until the Flash loaded (on my medium speed connection, it takes a while), but their Yosemite schedule is posted there, as well as other parks that they will be visiting over the rest of the summer.